With over ten years and more than 800 installations, from 3 gallons per day to 50,000 gallons per day, in areas as diverse as Duluth, MN and Hilo Hawaii, JCS has perfected, applied for and received US Patents for the all vacuum liquid feeder. JCS can also proudly state that we have the largest all vacuum liquid feeders (up to 60,000 gallons per day). The JCS Industries Model 4200EC Gas Vacuum Chemical Feeder mixes and feeds gaseous chemicals commonly used for water and wastewater disinfection accurately, reliably and safely. The system is comprised of a vacuum injector to safely introduce the gas into the feed-water stream, a reversing servo motor coupled with a V-notch valve to regulate the chemical flow rate, and a control module for complete electronic control and communications. The JCS Industries Model 420-Cylinder Mounted Regulator is designed for years of safe and reliable service. The Model U is an actuator system that can REMOTELY OPEN & CLOSE the valve on a chlorine or sulfur dioxide 150# cylinder or ton container. The Model RC is an actuator that OPENS AND CLOSES the valve on compressed gas cylinders such as chlorine and sulfur dioxide ton containers. The Model RC is an actuator that OPENS AND CLOSES the valve on compressed gas cylinders such as chlorine, sulfur dioxide, and ammonia cylinders and containers. 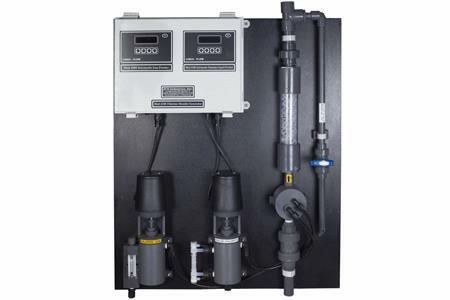 The Model 2000C is an actuator system to automatically open and close the valve on chlorine or sulfur dioxide ton cylinders. Chemicals are among the greatest allies that drinking water and wastewater treatment operations have in the fight against contaminants. But these operations are dependent on the proper technology to administer just the right amount of chemicals at just the right time, ensuring that effluent is neither under- nor overdosed. Drinking water and wastewater treatment operators are in a hazardous line of work. Beyond the large, complicated machinery they rely on, the use of chlorine and sulfur dioxide is a regular part of operations, two chemicals that can prove dangerous if not handled properly. The use of chemicals to treat water supplies can be traced back to the 19th century when English physician John Snow chlorinated a British water supply to stop the spread of cholera. As part of its Long Term Control Plan to reduce combined sewer overflows (CSOs) to the Merrimack River, the City of Nashua, NH constructed a new Screening and Disinfection facility (SDF) to reduce untreated discharges of CSOs to the Merrimack River. The public works director responsible for a southwestern U.S. city’s drinking water supply reports multiple benefits from replacement of a problematic peristaltic pump system with a special liquid vacuum feeder system for bleach, liquid ammonium sulfate (LAS), and polyphosphate feeds at one of its well sites. A municipal water quality manager reports replacement of sodium hypochlorite (hypo) vacuum feeder units with a more advanced type at one water treatment plant (WTP) has helped allow for continued reliability for chlorination. 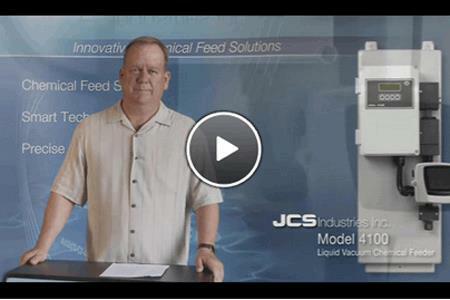 The Water Environment Federation (WEF) has named JCS Industries, Inc. of Spring, TX as a winner of one of its three Innovative Technology Awards for 2012, in recognition of the company’s patented Model 4100 Liquid Vacuum Feeder. Because of the success of the Liquid Doser, JCS was asked by the same company to develop accessory items and gas feed equipment. This was accomplished when JCS released the Model 4200 gas feeder. 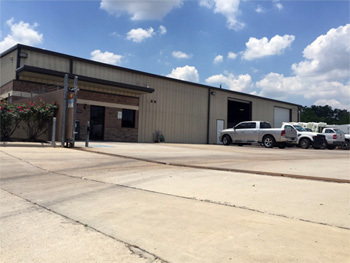 With gas systems that are online and feeding from 25 pounds per day up to 8,000 pounds per day, JCS is ready to create and improve on anything that is directly or indirectly related to feeding water and waste treatment chemicals. Here at JCS, we welcome your comments on how to improve existing products, and recommendations on the creation of the next generation of chemical feed equipment. President and Founder, JCS Industries, Inc.